In the “Moon Goose” project, Agnes Meyer-Brandis unfolds a complex and fictitious narrative that she presents in the style of an elaborate scientific research project. The project offers a poetic and playful reflexion about the status of scientific and mythical knowledge and invites us to revisit the narrative strategies employed in the presentation and justification of research. The project departs from the pre-modern myth of a specific type of geese that are thought to migrate between the Earth and the Moon. 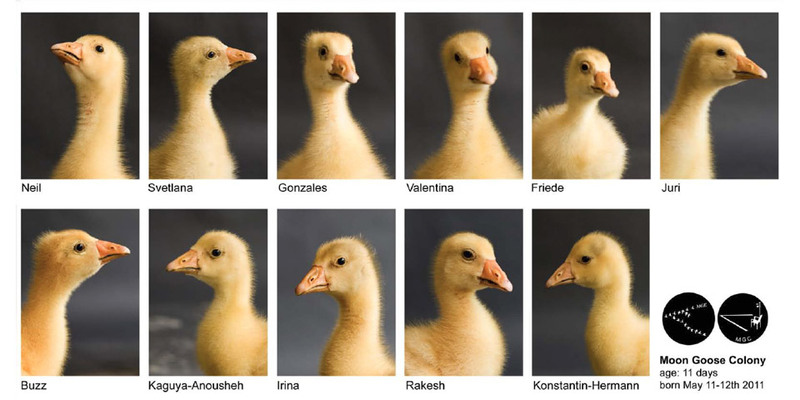 Based on this idea, Meyer-Brandis develops a series of experiments through which she supposedly seeks to breed and train modern geese to take up the behaviour of the mythical moon geese. In the exhibition, she presents photographic and video documentation that is there to testify to the effort and curiosity with which she has proceeded in these experiments. In the context of the VIDA Award, the project is a humorous and welcome invitation to take a step back from the seriousness of many research efforts and to consider the cultural preconceptions that so often pose as scientific evidence, and that are the no less important, mythical and narrative basis of the way in which we make sense of the world around us.